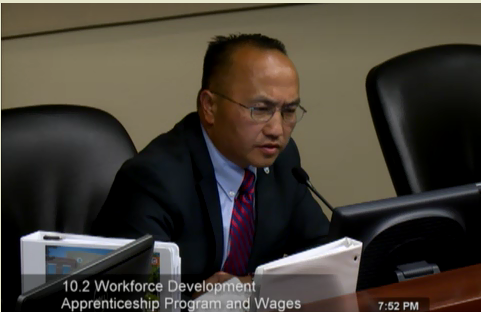 In a political setback for Mayor Steve Ly, the Elk Grove City Council last night decided against an immediate examination by city staff of the development of an apprenticeship program and changes to project labor agreements he had sought. Instead, two ad hoc committees of city council members were formed to examine the suggestions made by Ly. That decision came after a hearing that lasted over one hour that included ten speakers during public comment, who mostly focused on the project labor agreement (PLA) aspect of the proposal. A PLA is a document that binds an entity building a project, in this case, a public works project, to use only union members. While the discussion on the topic was lengthy, at times the conversation, especially during the council's deliberation was by their admission, murky. The deliberations veered from discussion of PLA's to the city's possible involvement in the development of youth apprenticeship programs. Opening deliberations Council Member Pat Hume noted the vast array of topics brought up during public comment and sought Ly for guidance on what exactly he was seeking. "Can I ask you what exactly you were asking for," Hume said. "Are you asking for a project labor agreement." Ly replied saying "my basic interest is the we invest our money wisely." Adding to the confusion was an exceptionally brief staff report by interim city manager Jason Behrmann. His presentation to the council before public comment and deliberations lasted less than 30 seconds. One public speaker addressing this was Nicole Goehring of Associated Contractor and Builders of Northern California. Goehring noted non-union contractors should not be excluded from the apprenticeship process should the city pursue that program and claimed PLA's hurt the community because it eliminates a large class of workers on a project. "What I heard in the video [from the May 9 meeting where the idea was first suggested] was things that are reminiscent of project labor agreements," she said. "And project labor agreements are very different from training the community and putting the community to work. So I would advise you as your deliberate to go toward a community workforce training agreement which is a project labor agreement." During public comment and deliberations, there was a fair number of people following the meeting and Tweeting in real time what was occurring. Below are examples of some of the comments posted on Twitter. (story continued below). If the Elk Grove City Council votes tonight to proceed toward giving unions a monopoly on construction contracts with a Project Labor Agreement, voters are going to find out about it. It will be a stark distinction among candidates in the next election. Noting there is currently a shortage of skilled construction workers, Hume said he would be willing to look at training programs. However, he said that should be dealt with separately from project labor agreements. "That is a different conversation from project labor agreements," Hume said. During what appeared to be rudderless deliberations, saying he saw some value in Ly's proposal, Vice Mayor Darren Suen suggested that ad hoc committees be formed to explore the matter. Hume and Suen volunteered to form a committee to examine project labor agreements. Suen also revealed that he has been working on a similar matter with city staff for a couple of months. He did not elaborate further on the detail of that work. While Ly agreed to the committee, he continued to press for city staff to pursue an examination of the matter independent of the committee's work. "We are in the position that we are using public dollars to invest in the community, it might be effective if we attach strings, so that are actually contracted with us, that they have to engage with the trade[s] [unions]," he said. "I think that is extremely important." While his council colleagues killed city staff from working on the idea, as a consolation to Ly, they permitted the formation of a second ad hoc committee that he would serve on after initially being excluded from Hume and Suen's committee. Ly, will serve on the committee with council colleague Stephanie Nguyen and they will look at youth training programs, with a focus on individuals released from Sacramento County Juvenile Hall where Ly works as an instructor. Noting the defeat, Ly said "my fear is this will be lost in committee and go no where." It's all about securing key endorsements during the campaign season. Just bringing the subject up lets him check off that box, just like district elections. Check.